Scotland's Graeme Shinnie show's his frustration at full-time. 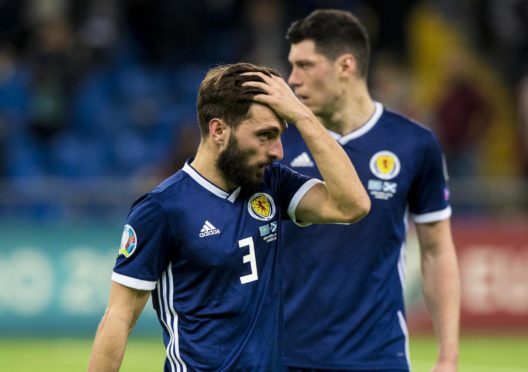 Graeme Shinnie fears he has blown his long-awaited Scotland opportunity following last night’s chastening 3-0 loss against Kazakhstan last night. Aberdeen skipper Shinnie deputised at left back due to the injury absence of Andy Robertson and Kieran Tierney but the former Caley Thistle player was at fault for the Kazakhs’ second goal on a dire night for Alex McLeish’s men. The 27-year-old feels he did not do himself justice on his first competitive start in his sixth cap. Shinnie said: “I can’t see myself getting back into the team now. On a personal note I am gutted in myself. I know I am so much better. I have waited so long to get a chance. “I maybe got caught a bit cold at left back in terms of my positioning, especially for their second goal. It was a tough night. They played well, they were on the front foot putting pressure on us. It was a hard game. Shinnie expressed his sympathy for the 650-strong Tartan Army who made the long journey to Nursultan for the Euro 2020 qualifying group opener. He added: “We share their frustration. They have put hours and hours of travelling in and probably been to a lot of different places to get here. It was a very good turnout from them for what they came out to see. Shinnie says the Scots cannot afford to dwell on the defeat, with a quick turnaround now awaiting ahead of Sunday’s Group I trip to San Marino. He added: “Every game is different. We came off such a high against Israel. In football you can’t get too high when you win and too low when you lose. “This is a disappointing night and one that we need to learn from. We need to get back to winning ways as soon as possible. The SFA confirmed last night that Celtic defender Tierney will not face San Marino on Sunday.